Universiti Malaysia Pahang (UMP) was established by the Government of Malaysia on 16 February, 2002. UMP was set up as a competency-based technical university which specialises in the fields of engineering and technology. UMP is located on the east coast state of Pahang, the biggest state in Peninsular Malaysia with vast areas of rainforest endowed with a wide range of biodiversity and natural resources. 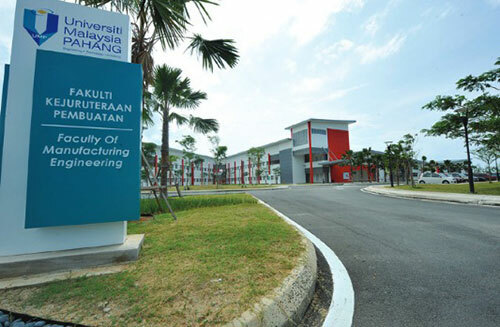 The campus is also strategically located in the East Coast Industrial Belt of Peninsular Malaysia, which hosts a large number of multinational corporations in the chemical, petrochemical, manufacturing, automotive and biotechnology industries. UMP offers a wide range of skills-based tertiary education programmes in engineering and technology to produce competent engineers. Why UMP is your choice for an outstanding and unique technological education experience? to be conferred a “Digital University” status in the East Coast Region of Peninsular Malaysiato be certified OHSAS 18001:1999 since 2007. Dato' Professor Dr. Daing Mohd Nasir bin Daing Ibrahim graduated with a Bachelor of Business Administration from Western Michigan University in 1981 and subsequently obtained his MBA from University of Arkansas in 1983 and Doctor of Philosophy from the University of Dundee in 1992. He has a CPA (Australia), Chartered Accountant (Malaysia) and a FCPA (Australia). Previously, he was Professor of Accounting at the Graduate School of Business, Universiti Sains Malaysia, Penang; Guest Professor of the College of Management, Hebei University, Peoples Republic of China; and Guest Professor, College of Industrial Management , King Fahd University of Petroleum and Mineral (2008, 2010). He received the 2010 AGBA Lifetime Achievement Award for Contribution in the advancement of Management Education and Scholarship in Accounting, recognised at the 7th at the Academy for Global Business Advancement (AGBA) World Congree, 1-3 Dec 2010, Putrajaya, Malaysia. Receiving a mandate as Vice-Chancellor of Universiti Malaysia Pahang on 16 May, 2008, Professor Dato' Dr. Nasir bin Daing Ibrahim is committed in driving UMP towards excellence. With the transformation agenda, he believes that with a strong governance based on values, strategy focused and performance driven high quality work can be achieved. He also set nine concepts that need to be prioritised by UMP to become a focused based university. This concept is a catalyst for employees to become a high performer in building up a culture of excellence. In enhancing the effectiveness of a centre or department, strategic restructuring has been introduced; this process will ensure that the capacity of the centre or department is utilised to the optimum. In addition, beginning 2008, the establishment of a fellowship scheme has boost the number of scholars with a PhD at UMP. Under his administration, many new engineering programmes that are relevant to the industry have been introduced. These academic programmes are guaranteed their quality by the relevant bodies such as EAC, MQA and JPA. To ensure that UMP graduates have the necessary and relevant skills, strategic alliances and partnerships with renowned overseas universities in offering twinning programmes, as well as strategic alliances with the industry has been tied. These alliances resulted in the opening of IBM Excellence Centre, Mandarin Language & Culture Centre and Centralised Laboratory that offers state-of-the-art facilities and high quality services. Producing outstanding graduates who are competent in various engineering fields by offering and providing competitive engineering and technological programmes. Spearheading cutting-edge, industry relevant research initiatives. Providing services and consultations to industries and the community based on UMP niche and areas of expertise. Establishing excellent management and work culture in producing a highly skilled workforce. I am pursuing the engineering Bioprocess major and there are so many things to learn and do. UMP was set up as s competency-based technical university that specializes in the fields of engineering and technology. I strongly believe that this place is perfect and professional in many ways. “I am furthering my study in UMP because the university has many excellent researchers. The university is also equipped with good quality and modern equipment particularly in biotechnology. Moreover, there are many outstanding lecturers here in UMP. From its website, I discovered that the university offers scholarship for PhD programme. That’s the reason why Ichoose UMP”. In the short period of time I was with UMP, I noticed that the lecturers are professional and very talented. The lecturers are also available to give personal advice whenever the students face any problems. My colleagues are also very supportive and we always help each other out. There is no better place to be than UMP!